Let's say a plane flies 10m above some trees, that themselves are 10m above the underlying ground. Would that be 10m or 20m AGL? Or, in more abstract terms: What exactly is the reference point for AGL? The actual ground that you would stand on as a pedestrian? The point where you would first impact something (even if it's just a very lightweight sprig)? something else? How does it work with objects like high bridges, that you could fly below but could still impact on a higher altitude? §91.119 Minimum safe altitudes: General. Following (a) and (b) is the safest course. Para (c) provides a great deal of latitude to fly low but has significant risks. Agricultural pilots fly very low all the time. But ask any one of them and they'll be glad to discuss all the stuff they've hit. These rules are primarily directed at VFR flight. Under IFR, ATC clearances are designed to ensure operating at safe altitudes, clear of both terrain and obstacles. There are a number of towers in a relatively small area. 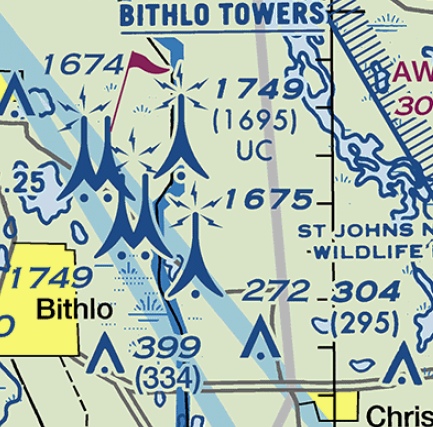 In this case there is the underscored BITHLO TOWERS label to bring attention to them. Adjacent to the tower icons are two numbers. The number not in parentheses is the height in MSL. In parentheses is the height AGL. The AGL is mostly taking reference to the Radio Altimeter. The RA is measuring the distance between the ground and the aircraft through waves sent to the ground and receive the rebound of it. The time between the ping and the pong gives you the distance between the aircraft and the ground (like a sonar). That being said,the reference of AGL is random. Because the RA should catch the top of the tree and if you were flying at a constant ASL with trees or hills below you, you will see your RA change all along your leg. Not the answer you're looking for? Browse other questions tagged terminology altitude or ask your own question. How do I know my AGL altitude while in flight? What is the reference point for AGL? How can you find AGL if the altimeter is set to MSL? What does “inertial” refer to in “inertial reference”? Is there a rule of thumb for reading AGL vs MSL? How are altitudes handled with airports near or above transition altitude?